Some simple touches make the difference between nice looking table and a truly amazing Valentine’s Day tablescape! 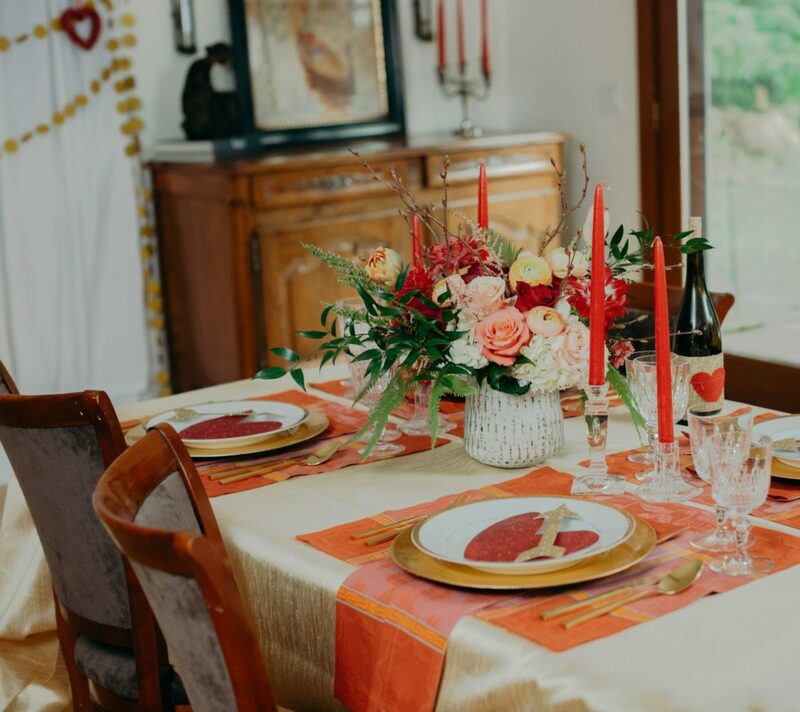 None of the ideas will break the bank – I spent between $ 3 to $10 on each idea yet they do a nice job of elevating your holiday table from good to great! Choose a fun paper to use as a wrapper, measure the flat section of the bottle and cut the paper accordingly. You can use double stick tape if you’d like but I generally don’t because what ever string I use to wrap around it holds it in place. For this table, I slide a felt heart close the the end of this banner and cut the string with enough string to allow for 2-3 wraps around the bottle. I done this before for a birthday party with a bunch of gold stars instead of the single heart so the idea is adaptable for any occasions. This is beyond easy! Just disassemble a garland that has hearts around 6-8″ and set single hearts on top of your dinner plates. The discontinued one I used had the glitter hearts clipped on to a cord, but a cute corded banner like this one can work too. Simply remove the cord and use thin ribbon to string a bit through each individual heart, or perhaps tie the hearts on to the plate with longer lengths of ribbon or cord. I found these red glitter cut outs or 2.5″ gold glittered hearts for a look closer to what I show. This is another super easy one! Use string or ribbon to figure out how long the garland needs to be by measuring between each light arm and add enough extra to create a swag. Then just pick a cute garland making sure to order enough for your light. I’m using two garlands that I joined together in order to get the length that I needed and they hooked on to my chandelier without any tape or wire holding it in place because of it’s open design. If your choice isn’t open in style, just connect and trim the provided cord or attach it to the light arm with thin fishing line. There are so many options available at Paper Source, Hobby Lobby, Target and on Amazon that I’ll leave it to you to choose your favorite. Floral arrangement: Herban Bloom, Vashon, WA. Gold flatware: from Amazon; currently out of stock in gold but available in black. This in stock gold set is quite close. China: NQM collection but similar patterns available at Bed, Bath & Beyond and Crate & Barrel. Also, consider this scalloped edge gold rimmed china – it’s so well priced and stylish. Crystal: Discontinued Nemours pattern by Baccarat. I like the Dutchess pattern by Vera Wang as it’s got a similar look and these $15 glasses from Crate & Barrel are a good look for the price. Tablecloth: a discontinued cloth but for a similar look, check out this on Amazon. Chinoiserie Pattern Napkins/Placemats: personal collection made by Beauville. Red candles: Higlow dripless 12″ red from Amazon. Red glitter garland and crystal candle holders: personal collection – discontinued.